Once assessment results have been uploaded into SchoolCity, either by scanning, GradeCam™, or online administration, the data can be viewed in a variety of ways. One of the Predefined Reports in SchoolCity SUITE is the Student Response report. 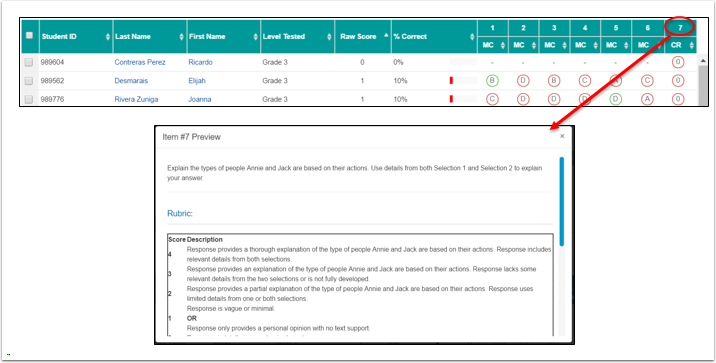 The Student Response Report displays student level data by item for the selected assessment. In the Top Menu Bar, click the grid icon (or current module name) to open the navigation grid menu and select Reports. Please see the Help document, Basic Navigation: Navigating the Launchpad 6.0, for more information. Click on the Student Response name in blue or on the view icon (eye) to the far right to go to the Student Response report. Note the descriptor statement for this report. Select Student Response to go to the report. Change Roster: Click on the down arrow to view a different roster. Change Assessment: Click on the down arrow to view results for a different assessment. Search Filters: Types of search filters depend on user role. Click on Refresh to view results. Filter Students: View data for specific subgroups of students. Key: The Key depends on student errors. (-) Omitted Response is included in this report. Preliminary Score: If set to ON in District Defaults, when a score is incomplete due to unscored CR/WP items, a red asterisk will display next to the student’s name. Time Spent (TS) (optional): Unclick the green box to hide the average time spent on items. Student Search Box: To view results for a specific student, enter the student’s last or first name, then click on the magnifying glass icon. Full Screen: Click here to expand the report view to full screen. PRA: Click here to view the PRA(s) assigned for this assessment, and the student results. Preview an Item by clicking on the item number. Note: Due to test security measures that may be in place, items may not be available for preview on some assessments. Students are listed alphabetically by default, but each column can be reordered by clicking on the column headers. In the example shown, the students have been reordered from lowest to highest by Raw Score by clicking once on the column header. Click again to reorder from highest score to lowest. Note: Only one column can be reordered at one time. To view how students performed on a specific item in order from low to high or incorrect to correct, click on the Item Type column header once. In the example below, Item #7 was reordered by clicking on CR (Constructed Response). Students are now listed from lowest score (0 points) to highest score (4 points). To view the Student History report for any student on the Student Response report, click on the student’s last or first name. Please see the Help document, Reports: Student History, for more information on this report.